F.L.I.P. – ing for Sandwiches! Our family has had several opportunities to serve the people of New Jersey in just the almost three months we’ve been here. It’s incredible what things come up if you are willing to serve! So, this year when Troy asked me what I wanted to do for Mother’s Day, I told him that I would like to help serve and not “be served”. It really is more blessed to give than to receive. I challenge you to go out and try it and discover how fulfilling it can be! We’re happy not only to be able to be used where we are, but also to enjoy doing it as a family. It certainly makes for lasting memories. On the flip side, later this week I will be posting more photos of our family, but not of serving, of making fun family memories learning about Washington D.C. and Colonial Williamsburg in Virginia for the Memorial Day Weekend. For now, I hope you enjoy viewing the memories we made below, with God’s leading. Here are some pictures of us at an event that occurs weekly, but Somerset Hills Baptist Church participates in it quarterly. Our church family makes sack lunches, which include a sandwich, piece of fruit, napkin, and a cookie of our choice, and then they are delivered by the pastor and the volunteers on our assigned day. 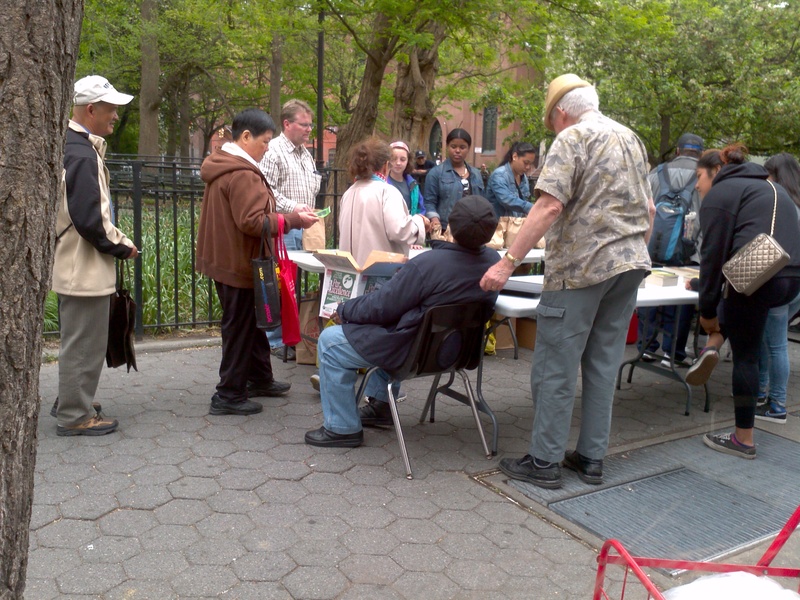 The weekly event takes place at Tompkins Square Park just a half block away from a church called “Graffiti” Church, in the lower east side of Manhattan. Not the safest place to visit, but definitely the best place to serve! Here are Troy, the girls and another member of Somerset Hills Baptist Church. 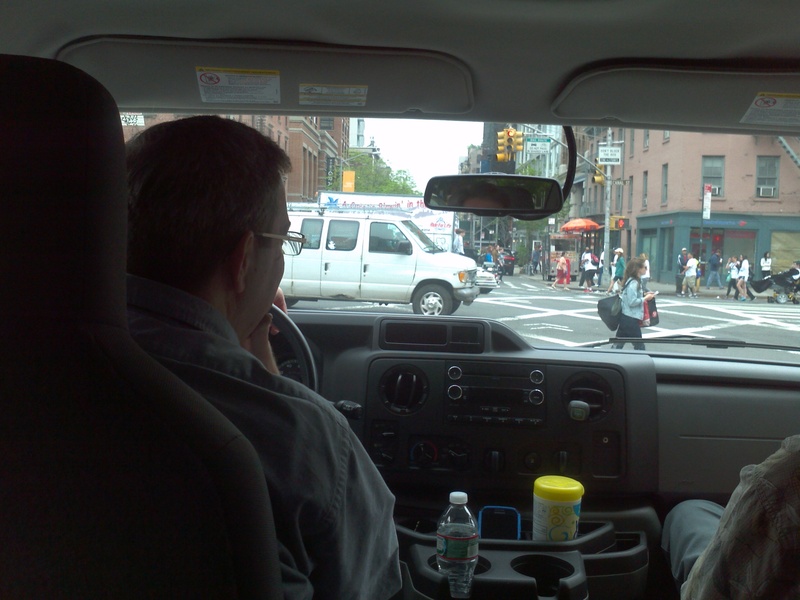 Our pastor is driving very carefully and strategically through the streets of New York. 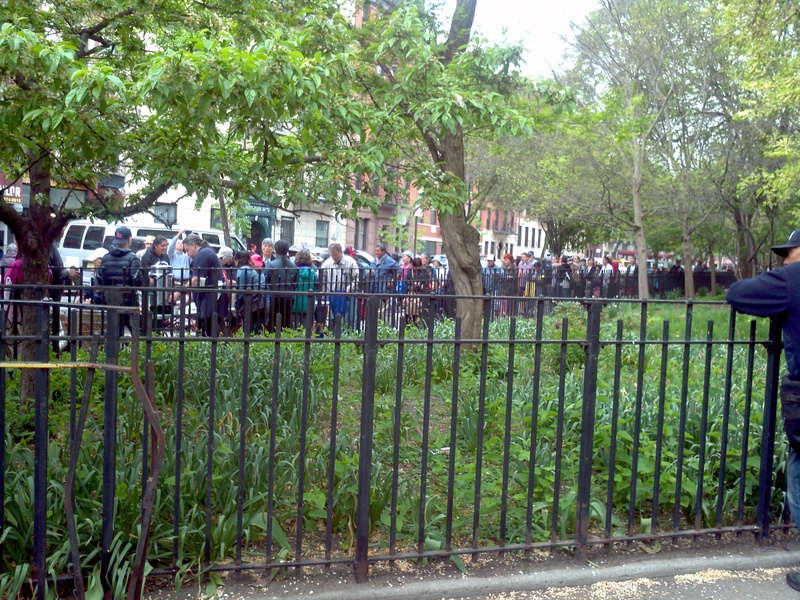 This is what the line looks like from the other side. 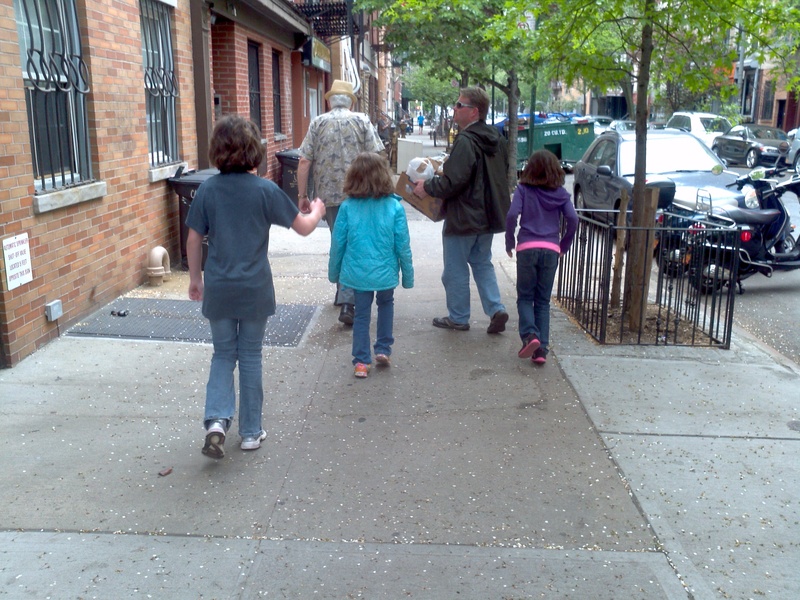 Here is Troy with our eldest daughter handing out “Free Lunches In the Park”, as that is what F.L.I.P stands for. Hope you had a memorable “Memorial Day” weekend! Lord willing, I’ll be talking to you very soon! I want to let you know what happened about a couple weeks ago, at the first moms workshop, on “How to Teach (My) Children to Love God’s Word” creatively. One of the moms that signed up came over for the workshop. I prepared my children for her coming by giving them the usual “mommy drill”. I said to them, “Remember why I’m doing this and why I need you to cooperate. I want to help this mommy to know how to love her child with God’s love, not in her own strength, right? Because if mommies love children in their own strength, it won’t be enough to prepare them fully in the ways of the Lord. And, as you have personally experienced, it’s not as good when I love you selfishly.” That is the truth. So, they agreed, and I prayed they would actually do what I asked them to do. When it came time for me to share more of my personal testimony and to allow time, if the mom was comfortable enough, to share her own, my girls intuitively knew that it was time for them to leave the main room and go do their own thing upstairs. In reality, they probably didn’t want to hear me talk anymore, so they went upstairs to avoid hearing my story, again. But, whatever the reason, it was used by God because the rest of the time was very intense. I believe it was an effective workshop, but the proof will be in the results that the mom has in her life. On another note, I want to share how God proved true to His word, once again! While I prepared for this divine appointment with the mom in the morning, I was going to find out very soon, the same day, what I had intentionally been doing to build my children’s lives, in the past, God would use to minster to me in return! My youngest daughter decided to have a “Tea Time” around 2 o’clock in that afternoon. I still hadn’t rested from the morning’s events or from the night before, in preparation for the first workshop or training session. God used Bethany to minister to me! Although I didn’t want to stop and rest for a moment like I needed to, I accepted the invitation to join her and her sisters. She said, “Mommy, can we have a tea time?” I thought for a second, “This could slow me down and keep me from doing something else that “I” feel I need to do.” I fought that thought and decided to honor her and sit to have “Tea”. Wow! God is so good (that’s an understatement)! For those of you who know me personally and have been to my home in Colorado, you know that I really love to make people feel welcome when they come in to my home, to show how much God cares for them. I almost always have coffee and tea ready in case anyone feels like enjoying a cup. Ministering to other moms and church family through home bible studies and showing them love through “Tea or Coffee” has been my modus operandi ever since we arrived in Denver. My girls know that, and I believe Bethany sensed that I needed some of that too. When she so innocently asked for this special time with tea, I couldn’t turn it down. She was either wanting to share in the moment with me what was on her heart and bless me or she was needing me to do that for her. As a result, all of us were blessed! Sometimes God uses your children to speak to you. I had invested in my children for years, by having tea time only and specifically with them and now I was reaping the harvest of sowing those seeds in their hearts! God’s word does not return void (Isaiah 55:10). Loving God involves loving people. Love the ones He has put around you first, and you will be blessed! Today a very special person, Vicky DeMartino, sent me an amazing gift all the way from California! She gave me a personally homemade, and sewn in love, quilt!!! It couldn’t have come at a better time. I was having a “pity party”, for different reasons. I truly believe that God sent this gift through her to remind me that He is listening to my hearts desires and knows what matters in my heart, especially when it doesn’t seem like most people care about or are listening to what I say. It’s a beautiful lap size quilt with different cups of “cocoa” on it, so it’s very heart warming. I was visiting her one year, in California, when she had been working on it, but didn’t know who it was going to be for, yet . I told her that my nick name is “Coco”, and that she could make it for me, jokingly, of course. Jokingly or not, she took me up on it, and she gave it to me because I told her that story. That was about 2 years or so ago. As I was admiring it, God gave me a word picture about quilts and kids. Quilts are like our children. They are conceived out of our desire to see them come to fruition; they are labored in love, over lots of sweat and time, sewing seeds of love, especially when we have to undo our mistakes; and, after so many years, we can finally see the resemblance of a finished product. Then, we give them up to someone else to be used, hopefully, in love. I pray that all the labor that I am putting into my “quilts” will bring me a sense of satisfaction and will bless someone else’s hands; whether it be to a spouse, a career, or for the use of the Lord, or all those things. We, as parents, are helping to stitch the very fabric of our children’s lives. Will they be received well? Are we intentionally and sacrificially giving into the making or breaking of their lives? These are all good questions to ask God to give us wisdom about. I do that almost daily because unlike a fabric quilt, I still don’t have all the pieces designed; that is in His hands. Happy quilting! And Happy Mother’s Day! To my pleasant surprise, the pastor asked me to meet with Him and go over the details of what I meant by my volunteer offer. After discussing it with him he agreed to make an announcement to the church the following Sunday, and several women actually came forward and signed up! I was very excited!! A few weeks later, and just before the first of four the workshops I would have in my home, my whole family attended an awesome family conference called “Homefront – Empowering the Family & Church Seminar” by Church Mobilization Center (Pastors and Planters of CMC). This event cemented our purpose in moving to NJ, specifically in my husbands’ and my heart. The main speaker, Dr. Rick Marks talked about how marriages in the church are a big reason why the church is becoming less effective in the U.S.A.. Marriages are breaking up almost as fast in the church body, if not exactly the same, as in the secular realm. Dr. Rick Marks pointed out that if we want our churches to be healthy, we need our marriages to be healthy. So, he made some points on how to better our marriages, but he spoke mostly to men. (Light Bulb moment coming…) That’s when I realized even more why I have felt lead to minister to women, and more specifically moms! Who is the heart of the home? Who is the caregiver and comforter? Most likely, the mom. If you want to make churches healthier, then reach the moms!! !